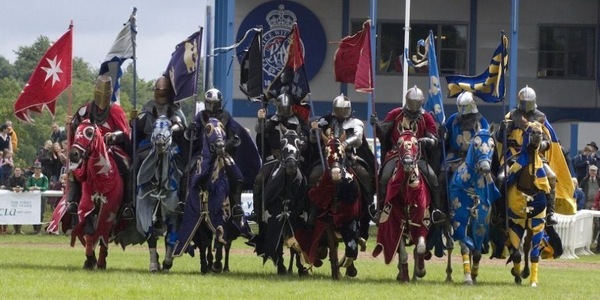 Bringing over 14 years of jousting experience in live shows and displays, The Knights of Middle England are a radical new born medieval jousting team that are bringing the “Knights of Old” into the 21st century! 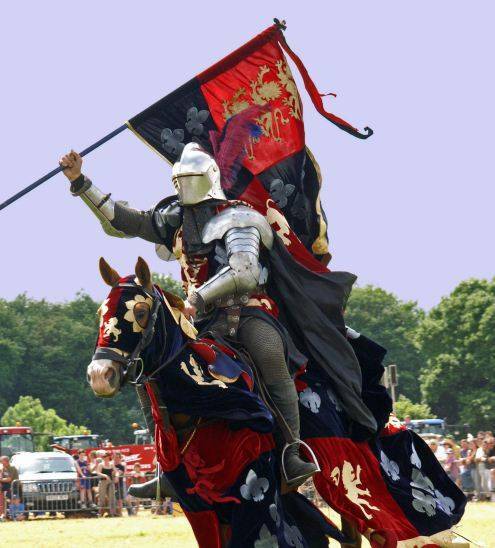 We are based in the heart of Warwickshire and neighbours to the famous Warwick Castle which provides a perfect setting for our jousting team. 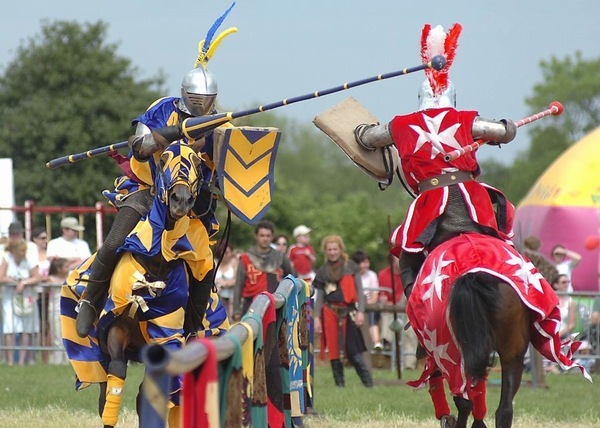 Our aim is to provide unique entertainment within the medieval era in the form of this traditional sport. We offer weekly training lessons at our premises, these can be group, private, full days, and weekends. We can provide accommodation at our premises or there are some highly recommended guest houses and hotels locally. With this in mind we are able to offer intensive courses for those who really want to get their teeth into this wonderful sport. We are very flexible and if you have an event/promotion coming up and would like us to provide the entertainment please contact us as we will be happy to put any ideas on the table. 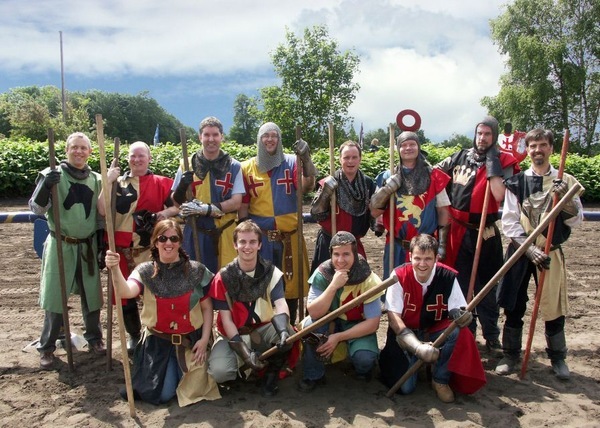 Stag and Hen Parties – We can provide you with a party for the day or weekend with full accommodation. The days include a full activity day with the addition of a lunch, evening marquee, banquet with huge hog roast, plenty of drinking, bonfire, music and adult entertainment on request. Cheer on your favourite knight as he gallops towards his enemy! 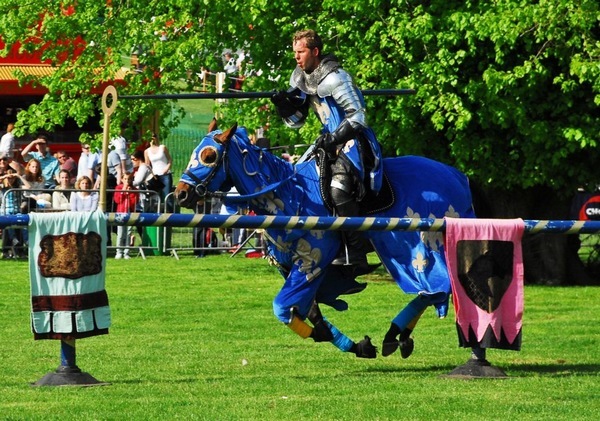 Boo the Black Knight as he causes havoc in the jousting ring! A variety of shows can be arranged from 2 daily displays of 30 minutes up to a spectacular action packed show of 60 minutes. We bring you actors, stuntmen and performers to supply you and your audience with a very intense and engaging family show. 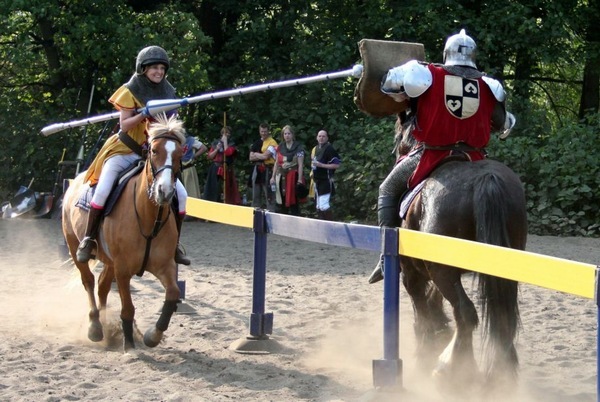 We provide you with a full-scale competitive tournament with bold, bright and beautiful costumed knights and horses performing heroic stunts, intense high speed action, a comic compere and our very own jester. 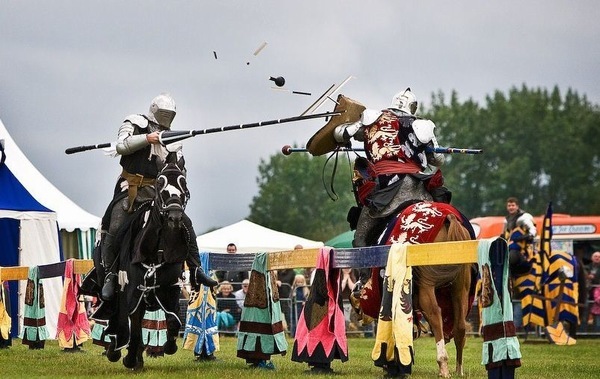 This show will thrill young and old as the knights display their skills in the games and then challenge their opponent as they thunder with lance and shield along the tilt to deal a heavy blow to their enemy. The Knights of Middle England pride themselves in involving the crowd as it is a major part of any events’ success if the audience is fully engaged and feel involved in what they are watching, the show is brought into the 21st Century with a modern day feel and a soundtrack that will quite simply rock them!! 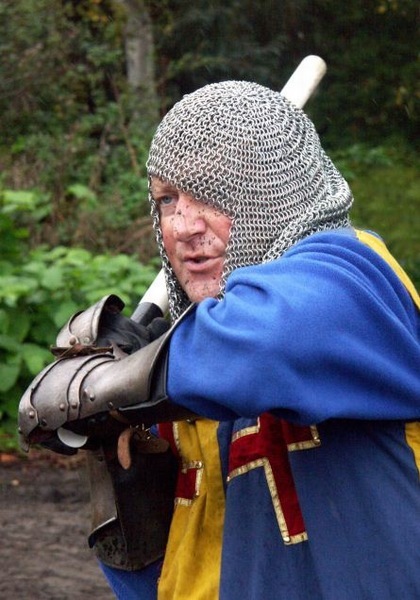 Our Demonstration and Educational displays usually involve one or two knights showing a short display of the history of a medieval knight and a full insight into the equipment, horse and training, this can be an additional part of your package, by request. Providing you have the appropriate setting we are able to entertain you at your desired location. If not we will advise and help source a suitable local location. Marriage Proposals – Surprise your partner! A different way to propose to your loved one. Be her true knight in shining armour! Complete in full medieval costume you and your horse can parade to her house and upon bended knee ask your princess for her hand in marriage. For ladies who dream of a fairytale wedding, dream no longer – whatever your fantasy for the special day, The Knights of Middle England are here to make those fairytales come true. 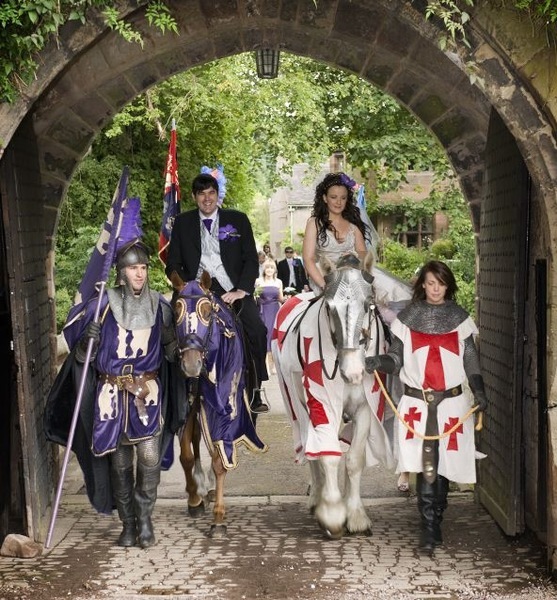 Be led to your wedding on a beautiful white charger, have colourful knights with your very own impressive Guard of Honour, let the knights mingle with and entertain your guests or ‘wow’ your wedding party with a spectacular jousting display just as they did in the days of olde.